CameraFTP Support Forum \ Problem, please help. I can't setup my camera during monthe. Thank you for your post, and sorry to hear that you are experiencing difficulties. Oddly, I cannot find any record of you reaching out to us via our support channel. Please email support@cameraftp.com for help with your camera configuration if you are having issues. I think that problem step is Motion Detection. See screenshot in attachment. I understand your frustration. Configuring an IP camera is not always easy. Please understand that CameraFTP does not control your IP camera. 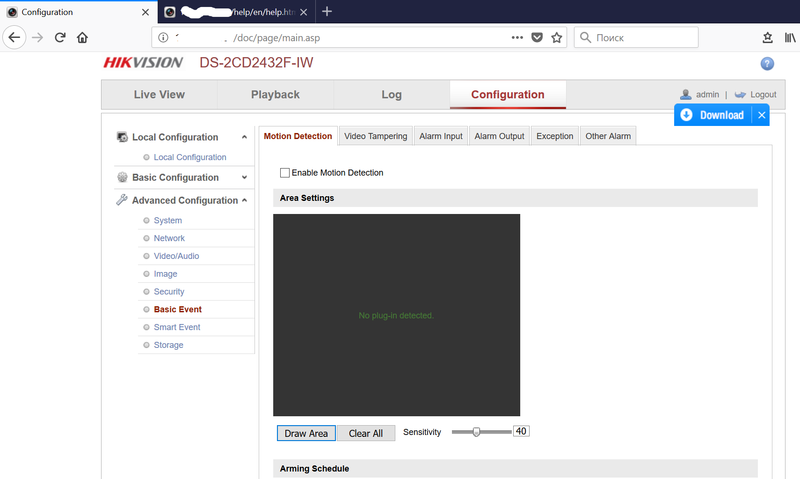 Our servers cannot connect to your IP camera, so they cannot automatically configure your camera. This way, your IP camera does not need to accessible from the Internet (thus it is more secure). Your IP camera needs to connect to our server and record data to our FTP cloud storage. We don't make or sell IP cameras; we don't select the IP camera for you. We can support you on all matters related with our cloud service, but we can only offer limited support on camera configuration. (There are too many camera brands and models). Based on your screenshot, you have not configured motion detection. Please make sure to install the camera plug-in first to view the video in your web browser. If your browser does not support the plug-in, please try a different web browser. (Firefox seems to have better compatibility in many cases. Only Internet Explorer supports the neen plug-in, not Firefox. It was find out empirically.